For centuries, garlic has been used as a home remedy and medicinal tool. Garlic contains at least several compounds that appear to contribute to its beneficial effects. The availability and amount of these components may be impacted by the garlic form -- whether raw, cooked, powdered or in supplement form. While garlic is a flavorful and popular culinary ingredient, if you are planning to use garlic to manage any medical conditions or if you already take prescription medications, talk with your doctor before taking garlic as a supplement or before greatly increasing your normal intake. In ancient times, garlic was used to treat wounds, parasites and intestinal disorders, and in recent decades this popular culinary bulb is known more for its perceived role in the management or prevention of conditions such as cancer and heart disease. Garlic contains sulfur compounds, enzymes, and a variety of nutrients including vitamins, minerals and fiber -- with some of this bulb’s health-promoting components not yet known or realized. One of the most active compounds in garlic is allicin, a potent antioxidant. Allicin is not present in whole garlic, but is produced after raw garlic is crushed or cut -- exposing one of garlic's sulfur compounds alliin to allinase, an enzyme. Garlic powder, made from fresh, dried garlic cloves contains alliin and allinase, but not allicin, according to a March 2001 review published in “The Journal of Nutrition.” Powdered garlic contains many of garlic’s other beneficial components, and some garlic powder pills are enteric coated with the promise that the supplement’s allinase will escape stomach digestion and allow some intestinal conversion of alliin into allicin. Thus, the chemistry of garlic is complex and the quality of garlic products, including powder and supplements, is dependent on the process in which they are manufactured. Garlic is thought to reduce heart disease risk through several mechanisms -- decreasing cholesterol production, enhancing cholesterol loss in the stool, reducing cholesterol in artery walls, inhibiting blood clotting, reducing inflammation and lowering blood pressure. But research on these health benefits has produced some conflicting results. For example, a small study published in the October 2010 issue of “Lipids in Health and Disease,” showed that a commercially available garlic powder pill lowered LDL cholesterol -- often called the bad cholesterol -- by 32.9 mg/dl in men, and by 27.3 mg/dl in women. However, a study published in the February 2007 issue of “JAMA Internal Medicine” compared the use of raw crushed garlic, powdered garlic supplement and aged garlic extract supplement in adults, and after 6 months found no significant improvements in cholesterol levels or differences between groups. A recent review of 39 trials on garlic and cholesterol levels, published in the May 2013 issue of “Nutrition Reviews,” suggest garlic use of longer than 2 months does lower cholesterol levels -- LDL readings on average by 9 mg/dL. While this may not seem like a significant change, the study authors report that just an 8 percent reduction in total cholesterol for someone aged 50 is linked to a 38 percent reduced risk of heart disease-related events. Garlic has been linked to a reduced risk of several types of cancers. While garlic contains several protective components, the sulfur compounds in garlic are thought to play a significant role in cancer risk reduction. A research review published in the March 2001 issue of “American Society for Nutritional Sciences” examined 19 studies on garlic and cancer, and linked raw or cooked garlic to a reduced risk of stomach and colon cancers. However, garlic supplements, including powder supplements, did not show a protective role. In addition, the study authors noted that the realized benefit could potentially be explained by the fact that frequent consumers of raw or cooked garlic tend to eat many vegetables -- a dietary pattern that also lowers cancer risk. More research is needed to better understand the impact of different forms of garlic and cancer risk. Garlic is proposed to have protective properties against bacteria, fungus, parasites and viruses, according to a report published in the January 2003 issue of “Journal of Antimicrobial Chemotherapy.” Although more than one of garlic’s components are likely responsible for this protective activity, allicin -- not found in garlic powder -- is linked to some of these benefits. 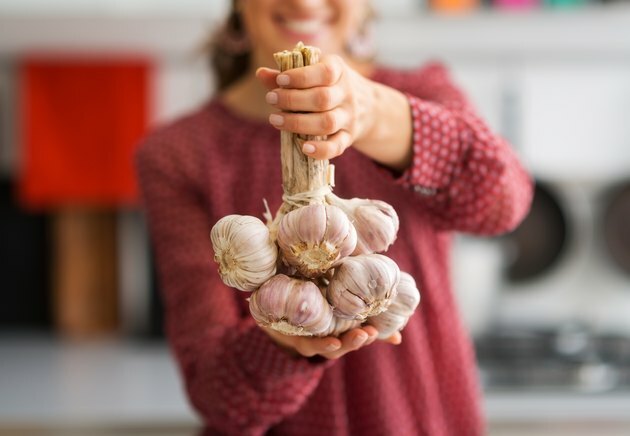 Study authors report that quality human trials need to be conducted, and despite the popularity of using garlic and other herbal supplements to treat infections, the available research on garlic is limited. Even with the many studies completed on garlic, results are conflicting. Garlic is linked to several potential health benefits. While garlic powder contains many of the same components as raw garlic, one of the most well known components -- allicin -- is linked to many health benefits but is not present in garlic powder. While garlic can be safe for most people, larger doses can cause breath and body odor, stomach upset, heartburn and sometimes allergic reactions. Check with your doctor about prescription drug interactions if you plan to consume large amounts of garlic or take supplements, as garlic can thin the blood in a manner similar to aspirin. Finally, if you plan to take garlic supplements, discuss the best form and dose with your doctor. What Are the Health Benefits of Allicin?